The lionfish, native to the Pacific Ocean, is a voracious predator with few natural enemies. It is also one of the venomous fish in the ocean with long, pointy spines. Although its venom is not fatal, a person being struck will have extreme pain and possibly headaches, vomiting and breathing difficulties. Recently, two young lionfish were found in the waters around St. Maarten. Thus far, none have been seen in St. Barth waters. 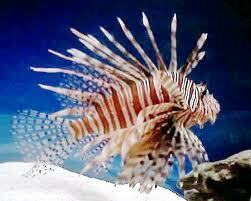 Because the lionfish has few, if any, natural predators, it can decimate populations of other fish. In addition, it reproduces very quickly. The Nature Foundation in St. Maarten is trying to collect every lionfish that is found to try to halt this invasive species from taking over the Caribbean waters.